I have had an LE No1 MkVI B Pattern for a number of years. It came to me as a pile of parts with little way of finding out any previous history. Once I put it all together, I started trying to interpret the markings. Mostly this has been done but one item eludes me. The markings on the left wrist which would normally include the Royal cipher and manufacturing info have been scrubbed. It was re-serialed into what Skennerton cites for some early war No4s with non-standard parts. My problem is the furniture. I know that there were variations in the checkering on the forestock but mine has none of this. I was told years ago on another website that, after Dunkirk, the UK withdrew stored rifles and rebuilt them as appropriate for whatever model for issue to non front line troops. Apparently, many of the No1 MkVIs were rebuilt as No4 Mk1Ts including the wood furniture. Mine included what appears to be normal UK No4 Mk1 wood. Does anyone on this site have anything to prove or disprove this regarding those MkVIs that were not rebuilt as 4/1Ts but use No 4 furniture? I think some photos would help on this one. The "Trials rifles are rare. I don't know enough about them to comment; but I'm sure somone here will be able to help. How will photos help to get any info regarding whether different furniture was authorized? I am at a loss here? Pictures will help identify your rifle by the stamps and markings and where the rifle originated from. We can also,by looking at the actual rifle tell you exactly what kind of furniture was original and what you can possibly use as far as wood from another rifle. The simple act of showing a clear photo of the rifle in question reduces the second guessing based on what is written. 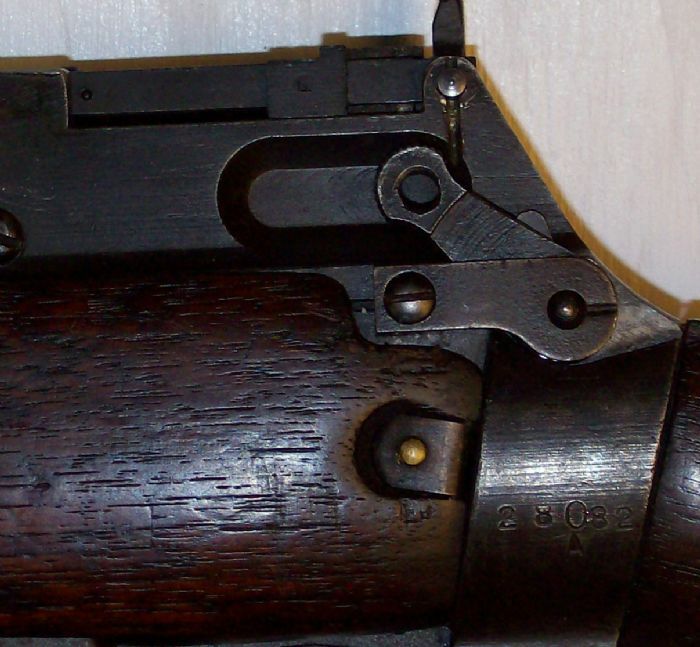 Only 1400 of the MkVI rifle dated 1931-33 were converted to the T variant minus the wood checkering. To clarify this somewhat, I have been collecting LMs and LEs since my grandfather gave me the LE 1/III that he carried during WWII. He somehow lost it in 1946. He was fined $10 for losing it and charged another $10 to replace it. About a year later, he returned to the Canadian Army base where he lost the rifle and found it. He later told me "I paid for it so I kept it." It is an NRF No1 MkIII star that war rebuilt and the star was barred out. It will be given to a younger family member. I still collect these rifles and have a somewhat extensive collection. Some of these include an LM 1*, LE 1/1, 1/III, 1/III*, 1/IV Con'd, 1/V, 1/VI, 2/II, 2/IV, 2/IV*, 5/1, 7/1, C 7/1, and others. I am on a continual search to answer questions that I have. Terry, thanks for the photos. I know the furniture is a replacement since the rifle was rebuilt as a No4. I was looking for any info on what, if any, were the wrong replacements and if there was any instructions on which might be correct ones. It appears that any forestock available early in WWII was acceptable for a rebuild. I have a question Tonsper. What do you mean when you say,it was rebuilt as a No4? You can swap parts out between the two but you cannot physically rebuild it into a No4. If it started life as a No1MkVI and it has different wood on it, it's still a No1MkVI. The master component of your rifle is called a receiver and cannot be rebuilt. You had mentioned about some of these rifles converted to the T variant. If you believe that yours is one of these,this would be the time to post some photos so we here can help identify what it is you actually claim to have. The curiosity factor of seeing what a MkVI rebuilt into a No4 looks like has me slightly giddy. Goosic, By rebuilt as a No4, I mean that the furniture, rear sight, and front sight protector were replaced with No 4 bits. The magazine cut off was removed and not replaced. The safety lever on mine has been replaced by a later version so is not correct. I have attached some pics but do not know if I am successful in doing so. No.4 Mk.I and No.1 Mk.VI.